Home » Articles » Lieutenant Colonel Ion Goff. 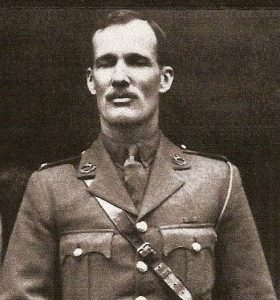 Lt-Colonel Ion Goff was killed in the Liri Valley on the afternoon of 15th May 1944. “It was now our turn. After getting the rest of our vehicles over the river, I went up to our support company and remained with our mortars and the anti tanks, who were closed up and parked a short distance from Brigade HQ – and here we stayed as the minutes ticked by, waiting. In the meantime, the enemy defensive shelling coming down on our front reached an intensity exceeded by nothing in my previous experience and I knew that our companies were having a very rough time. They were due to go in to the attack with the Lancashire Fusiliers of 11 Brigade coming up beside us later that night to widen and extend the breach. This was the second phase of the programme and, unless swiftly carried through, the Inniskillings had little chance of holding, or even surviving. Unfortunately, as the crisis approached, the enemy shot all too true and, while we were waiting there, they brought all to cessation on the start line in those last tense minutes. Ion Goff was down, mortally wounded, and a few minutes later the CO of the 16th/5th, Colonel John Loveday, followed him. By the time I reached the Tac HQ shortly afterwards, the battalion had already suffered heavy casualties in the fire storm, including Geoffrey Phillips, Ken Lovatt the signals officer and most of the signallers, who were with him. Jerry Cole, of course, sent me a message immediately and I went back with his orderly – with a brief prayer for Divine protection which was certainly now to be needed. I stuck my head in to Brigade HQ on the way and the only response was a cheerful wave and a grin from Jimmy, who knew that explanations were pointless and was appalled by nothing anyway. He said to hold everything and call up Pat as soon as things were in hand again.